Schnauzers are adorable and distinctive. The schnauzer is a robust, hearty dog in three sizes: giant, standard and miniature. All three are characterized by their "beards" and double coats. 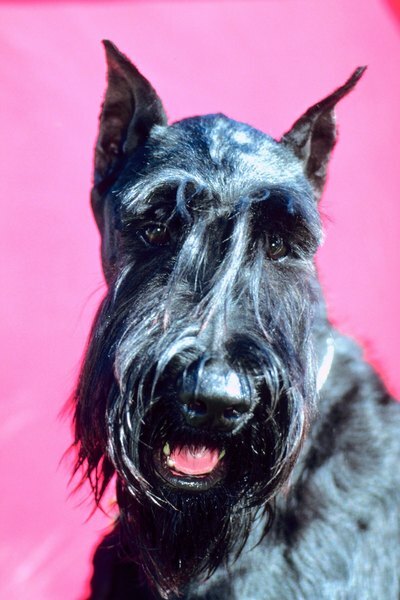 The schnauzer's top coat is a wiry and firm, while the undercoat is soft. Schnauzers require regular brushing to avoid tangles, knots and mats. Brush your schnauzer before washing him. While it may seem logical to brush your dog after a bath, the way humans brush their hair, it actually is better to brush prior to the bath to avoid knots while washing your dog's fur. Brush upward against the dog's coat. This will get into the undercoat and not just the top coat of fur. Brush the schnauzer's beard -- it gets knotted, too -- legs and underskirt. Be gentle but firm with the brush. After brushing your schnauzer thoroughly, follow with a comb. Combing can often find knots and mats that the brush missed; and it is important to get these combed out of the dog's fur before they become large and difficult to untangle. Brush your schnauzer at least once a week to avoid knots and matted fur. How Big Do Miniature Schnauzers Get? Is Lady Palm Safe for Cats?